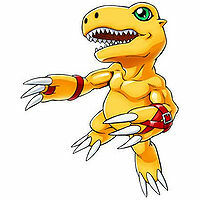 A unique Agumon which has bound red leather belts around its arms, its maturation is presumed to differ from its traditional evolutions. 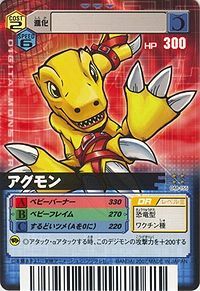 As it's still growing, its power is weak, but it has grown hard, sharp claws on its hands and feet, and demonstrates its power in battle. 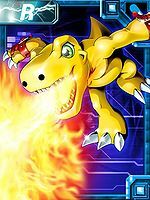 Its Special Move is spewing flaming breath from its mouth, striking the opponent (Baby Flame). 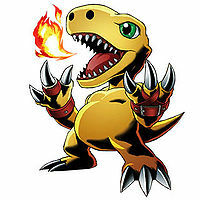 Also, it can amass "Baby Flame" in its mouth and then spew it out all at once (Baby Burner), which is much more powerful. 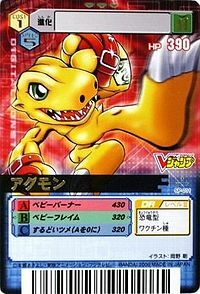 Having grown up and become able to walk on two legs, it is a Reptile Digimon which has an appearance like a tiny dinosaur. Because it is still on the way to adulthood, its power is low, but as its personality is quite ferocious, it doesn't understand fear. 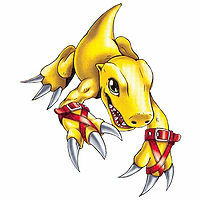 It has grown hard, sharp claws on its hands and feet, and demonstrates its power in battle. 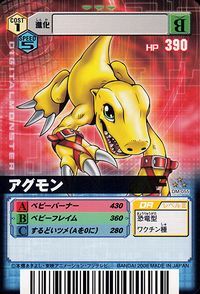 It is also a being that foretells evolution to a great and powerful Digimon. 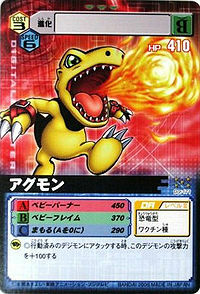 Its Special Move is spitting flame breath from its mouth to attack the opponent (Baby Flame). 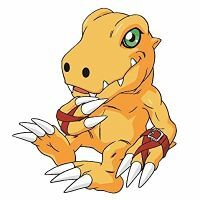 Other Names: 「アグモン（ベルト）」 — "Agumon (Belt)"
May have derived from "agu" 「अगु」 which means fire/flame. 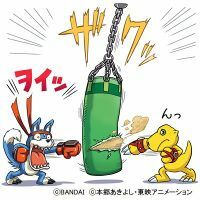 Anime/Manga Digimon Next: "Welcome to the Digimon Net Game!!" ベビーフレイム Bebī Fureimu Pepper Breath Spits fire out of its mouth. Breathes out a fireball that causes a huge explosion. 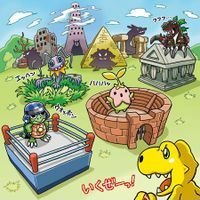 The user uses its claws to rend the opponent. Scratches using its sharp claws. ベビーバーナー Bebī Bānā Spitfire Blast Takes a large breath, and then exhales a large amount of fire forward. 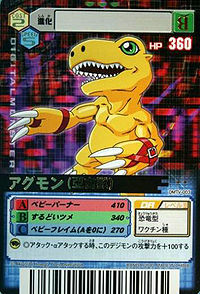 Agumon is the partner of Daimon Masaru. 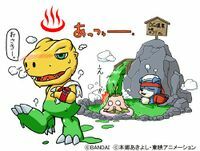 Agumon and his partner Daimon Masaru appear to assist in dealing with Quartzmon. 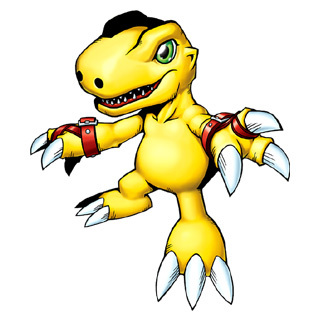 Agumon is the partner of Tatsuno Tsurugi and was initially seen as a Greymon. 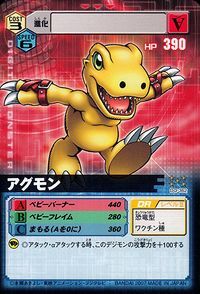 In a battle with Peckmon, a Piccolomon devolved Greymon to the Child level - Agumon. 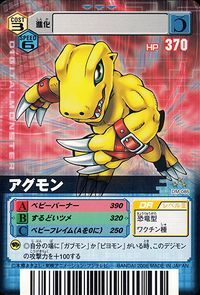 He gains the ability to evolve into Geo Greymon. 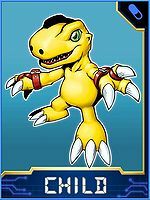 Like most other of the partner Digimon in Digimon Next, he is an Illegal Digimon. 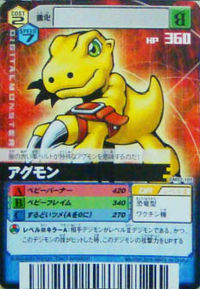 He has the Dragon DigiMemory. 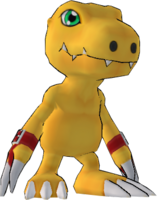 Agumon can be evolved from Koromon if above level 6, or can be found at the Data Forest if Koromon was your chosen partner at the beginning of the game. 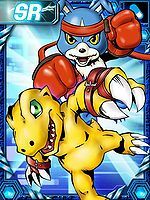 Agumon can evolve to Greymon if above level 15 and Friendship above 80%, or Geo Greymon if above level 17. He also gives you a request mission to obtain a DigiHotdog at Data Forest. 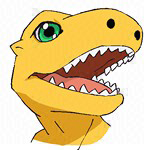 An NPC Agumon is found at the help desk, giving you few instructions on how to play the game. 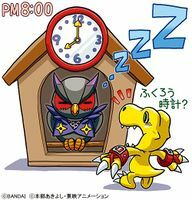 Another can be seen along side with Daimon Masaru from Digimon Savers during Onegai Quests. 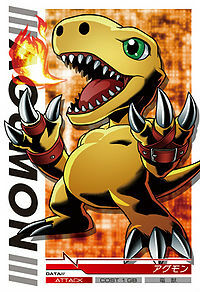 Agumon is a main playable character. 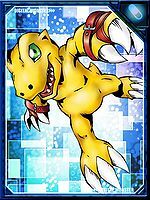 Agumon is #025 Digimon and is a Balance-class Dragon species with a resistance to the Fire element and a weakness to the Earth. Its basic stats are 111 HP, 115 MP, 83 Attack, 62 Defense, 56 Spirit, 57 Speed, and 22 Aptitude. 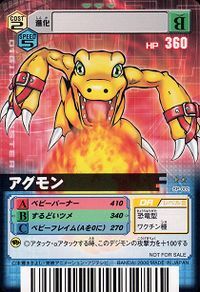 It possesses the Powerful 2 and Fire Aura 2 traits. It dwells in the Limit Valley. 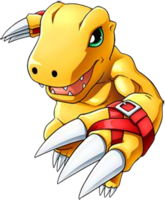 Agumon evolves from Koromon and evolves into Greymon or Geo Greymon. 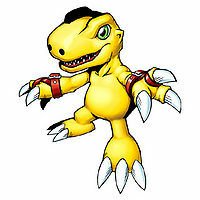 In order to evolve or degenerate into Agumon, your Digimon must be at least level 7. 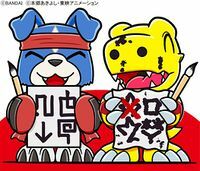 Agumon can jogress to Monochromon with Gottsumon. 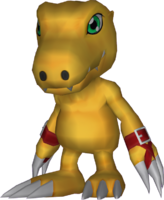 Agumon can be hatched from the Red Digitama or Fever Spot Digitama. 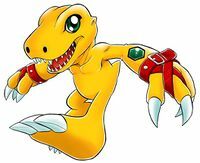 Agumon is an obtainable Digimon. 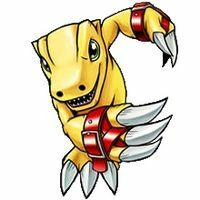 Can be evolved from Koromon if you win 3 battles. 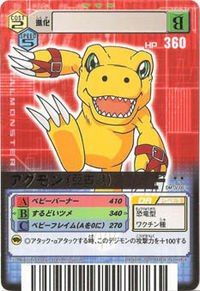 He can further evolve to Geo Greymon, Greymon, Scumon or Tyranomon. Pepper Breath: Inflicts 132 to 174 fire-attribute damage with 3 sec cooldown, consuming 8 DS. Obtained at level 1. Spitfire Blast: Inflicts 343 to 399 fire-attribute damage with 6 sec cooldown, consuming 22 DS. Obtained at level 6. 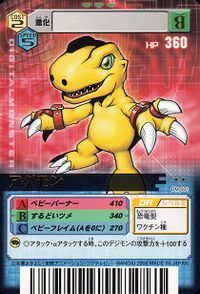 Agumon evolves into Geo Greymon over 11 level, into Rize Greymon over 25 level, and into Shine Greymon over 41 level. It can be found in Yokohama Village. It is only obtainable once you chose as the partner. 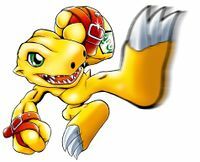 Evolves from Koromon, Wanyamon or Budmon. 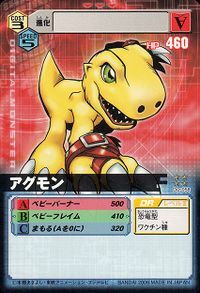 Can evolve to Geo Greymon, Gaogamon, Sunflowmon, Aquilamon or Numemon. 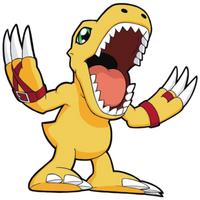 Evolves from Koromon, Wanyamon or Pinamon. 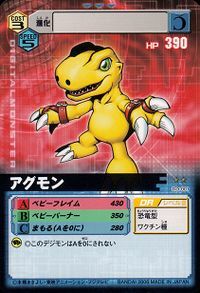 Can evolve to Geo Greymon, Gawappamon, Peckmon, Reppamon or Karatuki Numemon. 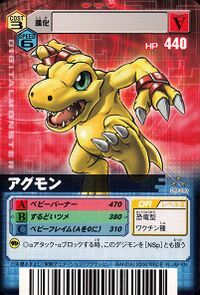 Can also Burst Evolve into V-dramon or Geo Greymon, or Full Burst Evolve into Rize Greymon. 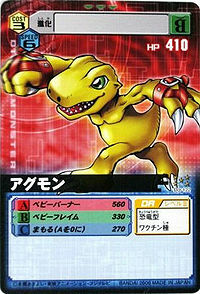 Evolves from Nyaromon. 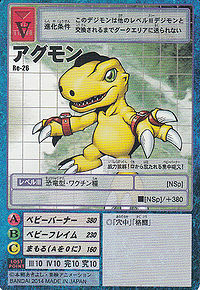 Can evolve to Geo Greymon, Growmon or Vegimon. Extraordinary power! It unleashes its Baby Burner from its mouth! 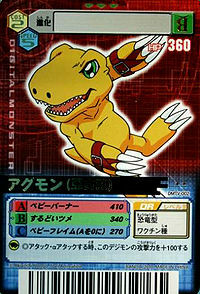 A unique Agumon which has bound red leather belts around its arms. 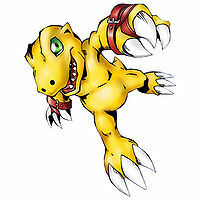 The red leather belts on its arms signify that it is a special type of Agumon! It is somewhat proud of its red bands. 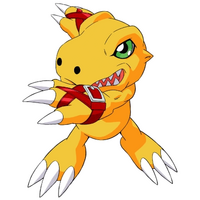 A special Agumon that has red belts fastened around its hands, unlike regular Agumon. 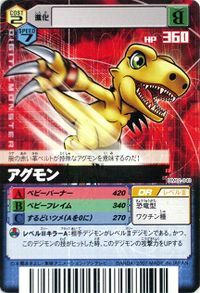 While its attacking styles and Special Moves are no different from a regular Agumon, it is thought that it follows a different evolutionary line as it grows further. 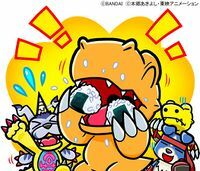 ↑ Digimon Savers: "The Perfect Ending! 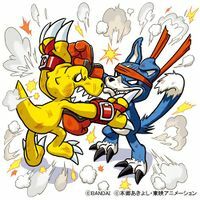 Farewell, Leader of Fights"
This page was last modified on 15 April 2019, at 22:23.